I grew up in Virginia with my parents and two sisters. My mother had dinner on the table every night. It was nothing fancy, but we always had delicious homemade desserts. That is probably where my passion for sweet treats began. I was always interested in cooking…from making dinner for my dad when Mom went back to work to preparing meals for the kids I babysat while in high school. When I graduated I debated between attending a four-year college or culinary school. College won out and I could say that culinary school would have been a better choice, but life has a funny way of working itself out. Everything I chose along the way eventually led me to where I am today. When I moved to Pittsburgh, I worked in a number of local resturants: Sharp Edge, Piper’s Pub, Sunny Jim’s and Willow. The variety of dishes served in these places opened my eyes to a whole new world of food. I grew my love of cooking using what I learned and began preparing meals for friends and family. I also would bring in sweets and dinners for the staff. When the Bellevue Farmer’s Market started, I decided to join selling biscotti. I did quite well and then started selling at more markets until I was doing six a week. I did all the baking from my home and quit my job to devote my full-time efforts to baking and selling. When the Muddy Cup Restaurant opened in Bellevue I asked the owner if I could use her back room as a kitchen. I baked my biscotti and started making one other product…ginger snaps…with a secret ingredient (olive oil…not so secret now) and they sold like crazy at the markets! People started asking for more varieties. Biscotti soon went by the wayside and I focused solely on cookies. In November 2014 I opened the Bellevue location of Good L’Oven. We sell mostly cookies there and in January 2017, I expanded and opened the Ross Township store. 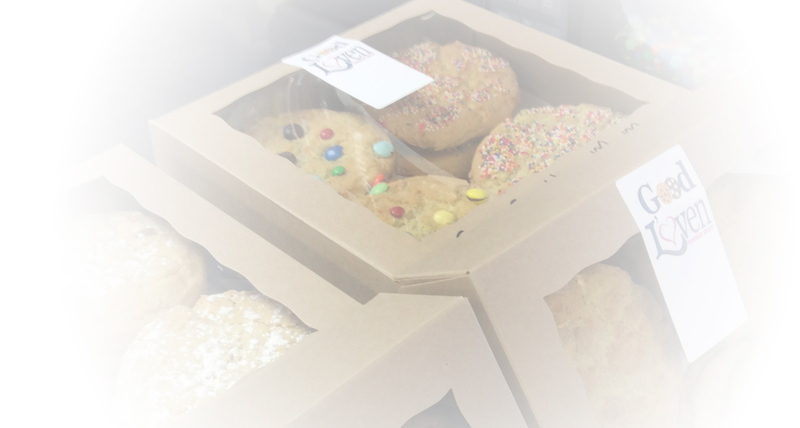 We prepare and sell our array of cookies, but have also added breakfasts, lunches and catering to our menus. My recipes are not super secret or intricate, but there has been a ton of trial and error through the years. Most importantly, we use butter! And it’s important to me that I buy the supplies from a local distributor. I buy extra ingredients as needed when I am inspired while shopping or reading others’ recipes. Through all the years we have truly been a family business. My daughter Olivia has grown up in the kitchen waiting on customers. Bill my husband keeps the books and helps with marketing. I sincerely hope you enjoy your cookies and/or meal from Good L’Oven. 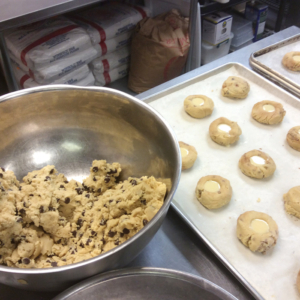 We prepare our cookies and specials fresh every day…like my mother did for us. My goal is to bring back a little bit of “good l’oven” and fond memories from your own childhood each time you visit us. Isn’t that what good food is about?